Liverpool host Southampton at Anfield on Saturday afternoon hoping to extend their perfect start to the Premier League season. 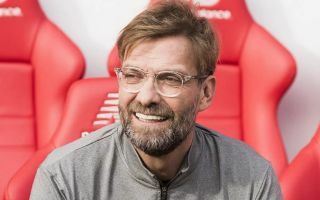 The Reds have won five in five so far this campaign, scoring 11 goals and conceding just two while they also got off to a winning start in the Champions League in midweek. Captain Jordan Henderson returned to the midfield for that clash with Paris Saint-Germain after being left on the bench against Tottenham, while Roberto Firmino’s eye injury meant that Daniel Sturridge got an opportunity to impress and did so against the French giants. Nevertheless, that does offer two key selection headaches for Klopp this weekend now, as it remains to be seen if Henderson and Sturridge keep their places in the starting line-up. As noted by Goal.com, the German tactician has suggested that Firmino and Sturridge can play together rather than merely being in direct competition with one another for the spot as the lone frontman. In turn, with Liverpool expected to dominate possession and dictate the game against Southampton, it could be worth playing that extra attacker in order to help find breakthroughs. That being said, it’s perhaps more likely that Klopp will stick with his preferred 4-3-3 system, with Naby Keita arguably in line to come back into the XI with Georginio Wijnaldum the one who many would fancy to miss out if Henderson is to now keep his place and is fully fit. Meanwhile, it would be no surprise if Firmino came back in to replace Sturridge after coming off the bench to score the winner against PSG in midweek, and so it could be a very familiar side for the Reds which is arguably ideal for Klopp to get that consistency in their performances and results. Probable Liverpool XI: Alisson; Alexander-Arnold, Gomez, Van Dijk, Robertson; Milner, Wijnaldum, Keita; Salah, Firmino, Mane. Alternatively, Klopp could go for: Alisson; Alexander-Arnold, Gomez, Van Dijk, Robertson; Henderson, Keita; Salah, Firmino, Mane; Sturridge.